Corsica, off the French south coast, produces delicious dry white and subtle rosé wines that are best drunk chilled, young and fresh as an aperitif or to accompany light meals of seafood, salads, tapas. Wine of Corsica is the common appellation to all the wines of Corsica, with the following AOC classifications related to either the soils or the villages in which the vineyards are grown: Ajaccio, Calvi, Coteaux du Cap Corse et Muscat du Cap Corse, Figari Patrimonio, Porto-Vecchio, Sartène. While Corsica is definitely “south of France,” it does not fall under the newly minted branding of “Sud de France,” a term that is being used by the region of Languedoc-Roussillon as they voyage forth once again onto the world export stage with their wines and other agricultural products. Corsican wines are one of those “well-kept secrets.” The island, which the French call “L’île de Beauté,” produces some great wines but they aren’t exported much overseas…yet. Set in the Mediterranean Sea, many of the island’s wines originate from Italy. The sun’s reflection on both white rocks and the Mediterranean brings even more energy to the vine which, combined with low yields, will eventually produce a very concentrated grape. 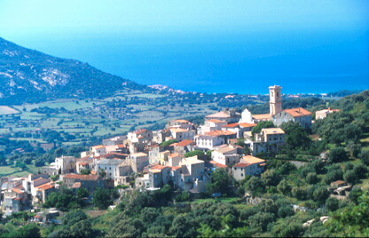 Typical Corsican Village. Perched between the mountains and the Mediterranean Sea. Cap Corse Wine This white wine is pretty rare and much appreciated by winelovers. Many agree that it is the best white wine in Corsica. Sartene Wine This is an excellent wine, and the red San Michele is definitely a must-taste. These are fruity and warm Corsican wines. Patrimonio This wine is as famous as the classic Corsican appellation and its quality is constantly growing. Corsican reds and whites are increasingly famous even out of the island. Patrimonio rosé wines are also fine wines. Patrimonio wines have a pretty strong character that originate from the soil, which is composed mostly of clay and limestone. This Corsican wine is full-bodied but still light and fruity. Ajaccio The Ajaccio French wine boasts the distinction of being the most elevated wine region in France. Most of its vineyards are located 500 m and above. This Corsica wine benefits from the warm weather, and the sea air provides it with a very particular flavor too. This French wine fully benefits from the Corsican environment thus it is light coloured, fruity and has a pronounced pepper flavor in the mouth. The Ajaccio soil is mostly granite. 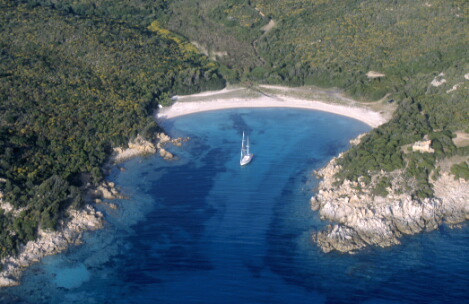 They also have excellent beaches in Corsica!